When I asked my husband to get SOME artichokes if he happens to see the truck selling them at the town, I didn't mean a whole big box of them with an added bonus of a whole sack of white onions. I stopped counting the artichokes after 30. The onions were more than 50 at my estimate. I wondered why he bought them in the first place when he despises onions (and garlic). He said the prices were very good. My first thought was how in the world will I cook all those when there are only two of us who eat artichokes and I'm the sole person at home who can eat onions? After days of searching for possible recipes, I finally came up with a much better idea. I gave half of my vegetable loot to our neighbor. She's one of those Italian women who's eternally in the kitchen and can whip up incredible country food. She's my main supplier of missing ingredients when I run out of them. And she's always sending her pies and cakes to us with verbal instructions on how to make them. I have yet to step over to her house to learn how to bake some salty pies and sweet cakes that I have been meaning to tackle. I remember once, when our dog caught a partridge in our garden and my husband and I didn't know what to do with it. Just the thought of plucking the feathers and cleaning it up for cooking made me feel weak in the knees. Our solution? Our dearest neighbor. The husband came to pick it up, explaining the whole process of cleaning and cooking it. Our dog was not so happy with what was happening. Worry and disappointment was written all over his poor face. It was his catch after all. Why can't he keep it? After I gave her the vegetables, she suggested some recipes that I could try. I went for this torta salata ai carciofi because my husband had been hounding me for a long time to make some rustic salty pies. So here it is, after the second try, I am finally happy with the result. When the fruits and vegetables are unbelievably cheap, I become suspicious. There has to be a catch why the vendor is selling them at a lower price than the others. I was disappointed when I cleaned the artichokes that my husband bought from the truck. There were too much chokes and the leaves were not crisp and snapping anymore when I was taking them off. We were given old artichokes. So the first torta salata didn't come out as expected. 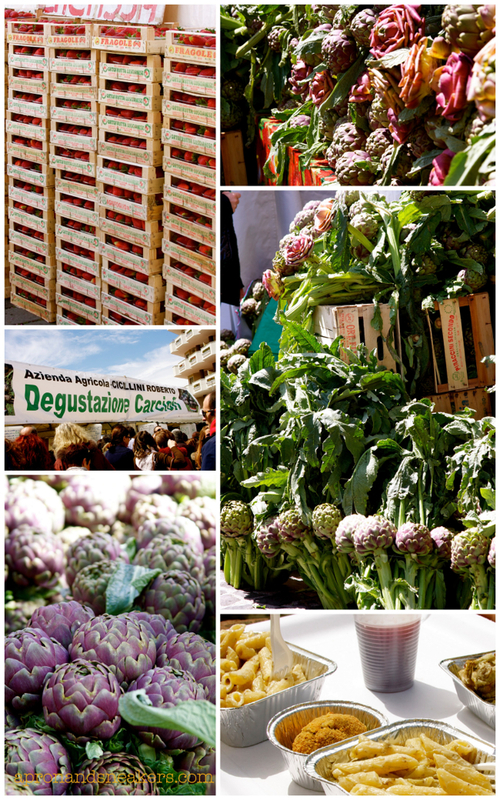 The annual Sagra del Carciofo Romanesco in Ladispoli was coming up. 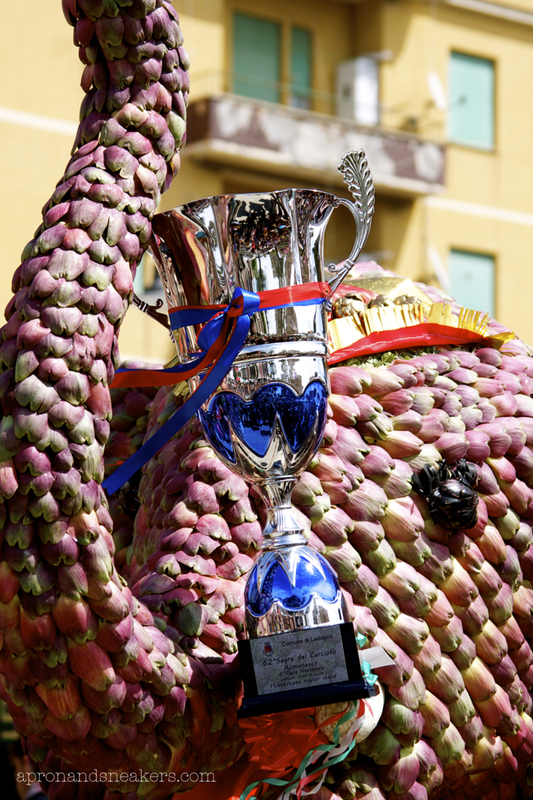 It was scheduled on the weekend of 12 - 14 April in the seaside town of Ladispoli in the province of Rome. I was determined to get my share of good artichokes that weekend. It was my first time to visit the town that is known for two things. 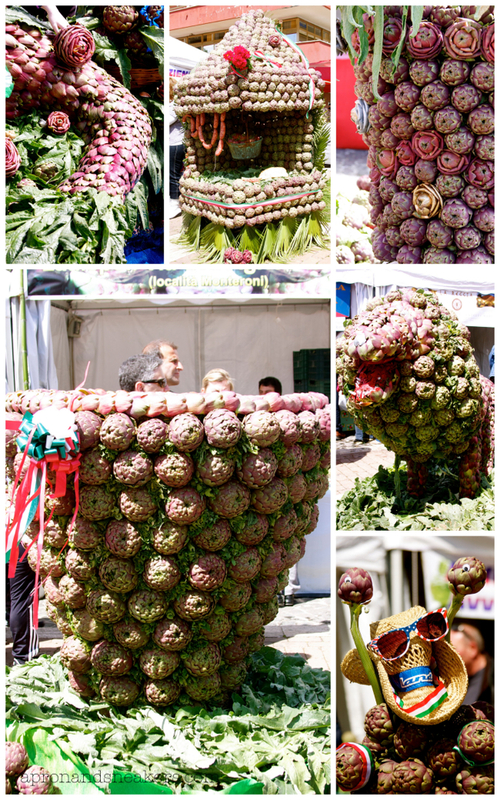 The artichoke festival in spring and the beach in summer. We arrived at mid-morning and the place was already crawling with people and bursting with activities. The town had been holding this event for more than 10 years and I have read and heard so much about it. I was excited to take part this year. I've been to a number of sagre (festivals) in Italy and this ranked as the busiest and the biggest I've been to. The whole stretch of main road was closed, dotted with market stalls selling everything that you can imagine, food and non-food related. Among these hundreds of stalls, we discovered the best ciambella (Italian donut) we have ever had. Freshly made, just warm, it was a delicious way to start our day. I could have taken a picture but my hands were busy with the kids and with my ciambella. We were all covered with sugar. 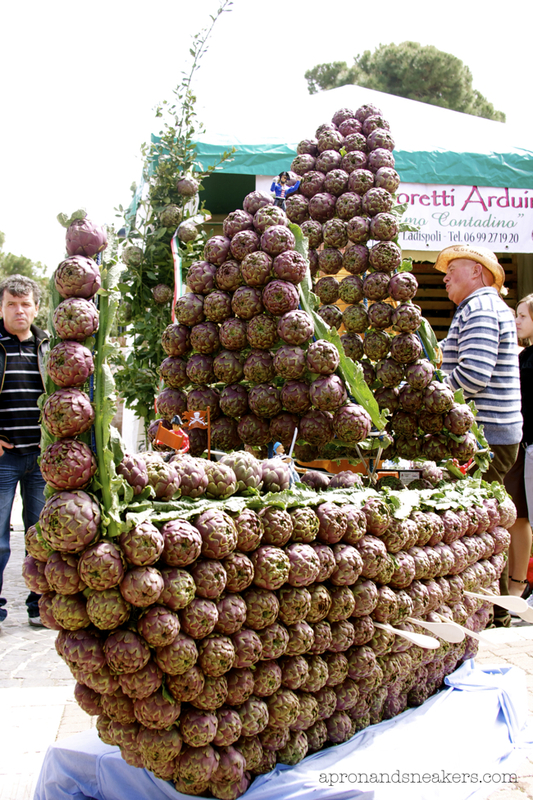 At the main square, we found different statues built with artichokes. The obvious winner was the most photographed and most impressive. I would have chosen the elephant too. It was oustanding. The pirate ship was beautiful too. At the end of the road, next to the beach was the square with food stalls from all the Italian regions and the celebrated artichokes of the town. It was literally impossible to move around with a stroller and another kid in hand, both complaining of hunger. Queueing was one thing. Taking pictures was another thing. Finding a place to eat was an impossible thing. Balancing a food tray in our hands while pushing a stroller and making sure our son is still attached to our little group while pushing ourselves through the crowd was an arduous task. After finding our spot, standing up, in front of the beach, we enjoyed our artichoke full-course meal with the local wine. It was an experience but next year, we will be smarter. We will head to one of the beachfront restaurants, sit down, order our artichoke meal and let the kids play on the sand. The artichokes for sale were inexpensive but for a good reason. It was the festival. I got a box (smaller than my husband's prior purchase) and broached the task of cleaning them the following day. They were crisp and the leaves were making beautiful snapping sounds. The chokes were so little that I didn't have to clean the hearts so much. No wonder they are popular. They are good. If you want to learn about how to deal with your artichokes, here's a very informative site about Taming the Artichoke by The Ardent Epicure. 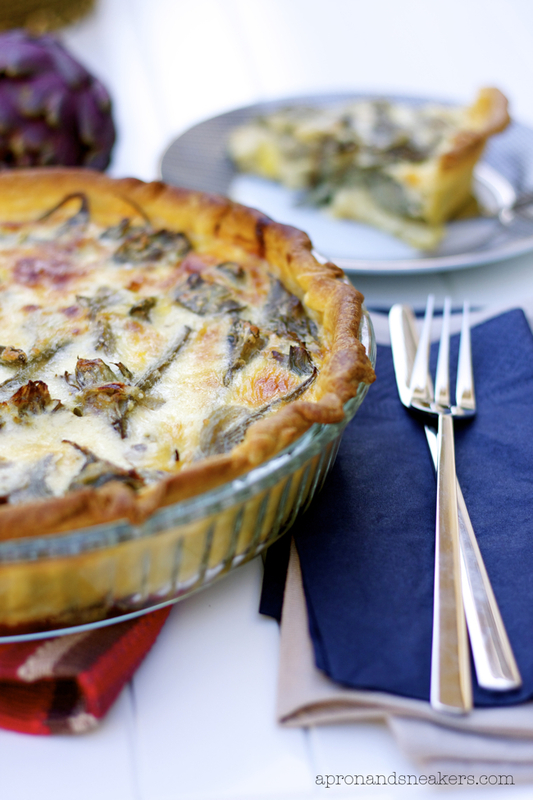 I had to adjust the measurements given in this recipe because the artichokes were too much and the eggs and milk were not enough to cover the quiche. Enjoy this recipe I got from Giallo Zafferano (recipe in Italian). We did. For a step-by-step cleaning procedure with pictures, here's Anna Maria Volpi of Anna Maria's Open Kitchen's tutorial that's very useful. This is the way I have always cleaned my artichokes. 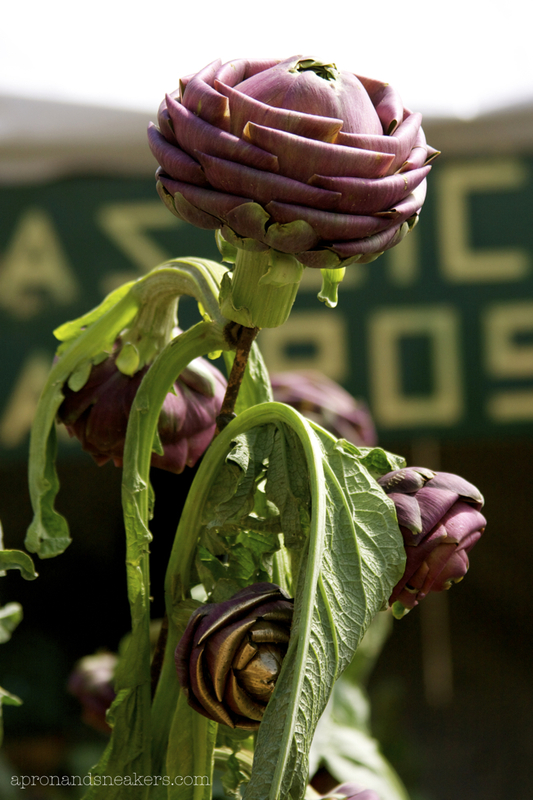 If you want to learn more about dealing with artichokes, here's a very informative site about Taming the Artichoke by The Ardent Epicure. Artichokes can leave stains in the hands so it's best to work on them with a pair of disposable gloves. Slice one lemon in half. Squeeze the juice of half of the lemon in a bowl of water. Put also the squeezed lemon in the bowl. Take away outer leaves by tearing them from the base. 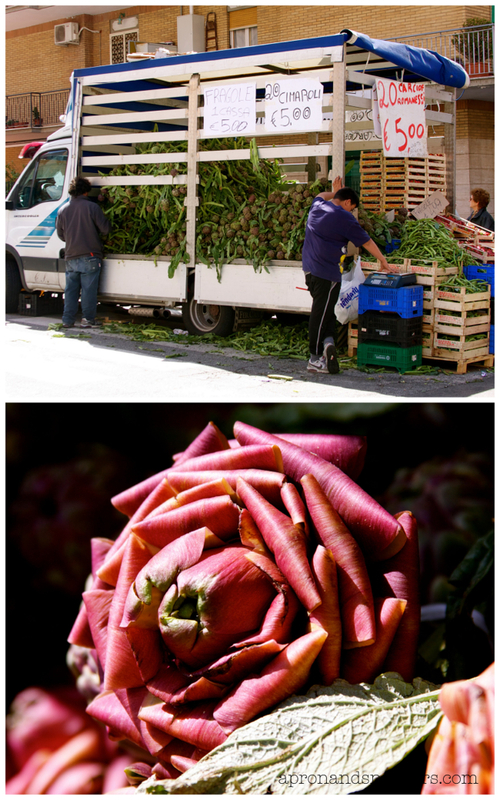 If the artichokes are fresh, they would snap easily. Cut off the stem, leaving about an inch from the base. Cut away middle-upper part with a knife. 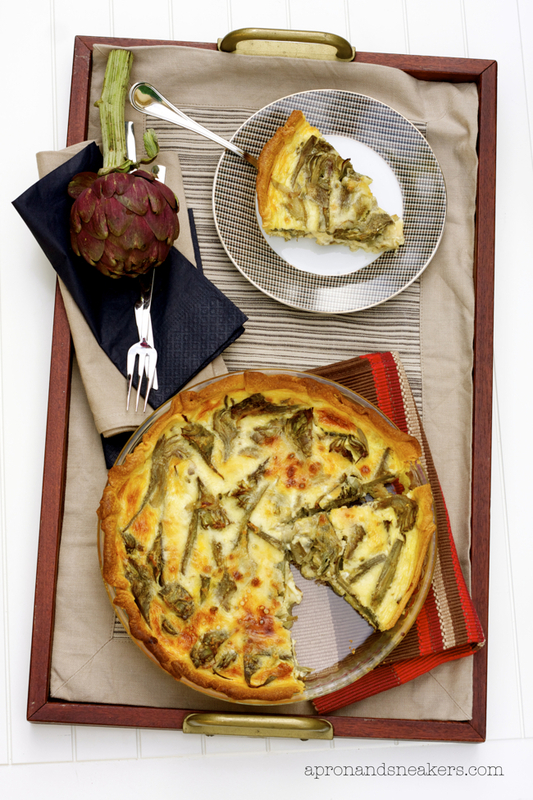 Make the stems thinner by peeling the outer part from the bottom going towards the base of the artichoke. Clean around the artichoke by paring the leaves that are sticking out. 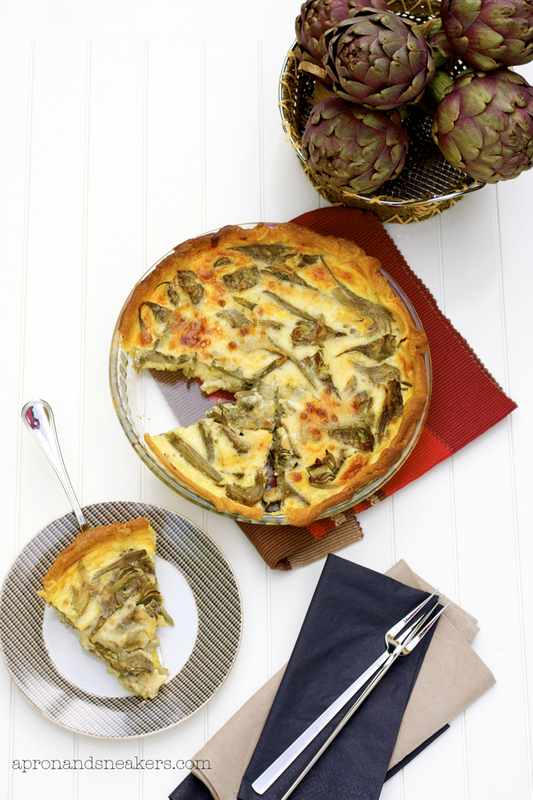 Scoop out the fuzzy chokes at the center of the artichoke with the tip of the knife until you reach the tender part. You can also use a teaspoon to do this. Rub the whole artichoke with the remaining half lemon. 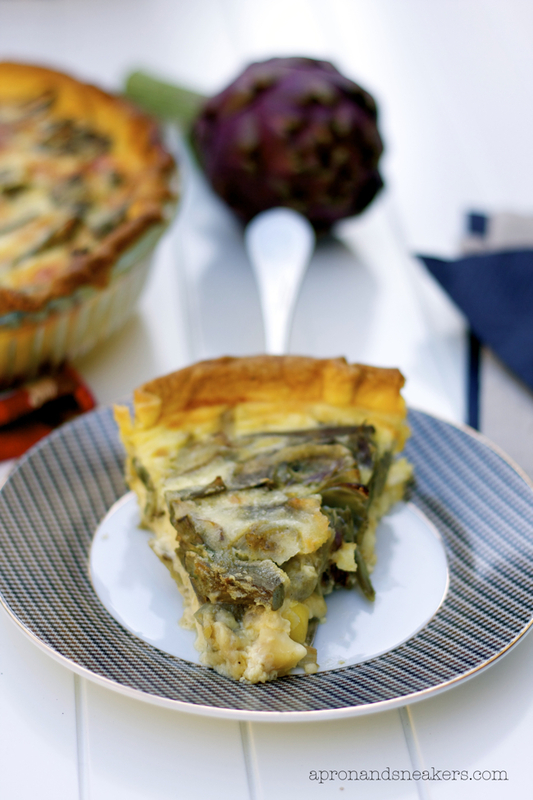 Slice the artichokes in eight wedges. Then leave them in the bowl of lemon & water until you clean all the other artichokes. Saute' garlic big saucepan with about 2 tablespoons of extra virgin olive oil. Add the drained artichokes and cook for a few minutes. Season with salt & pepper. Add a ladle of hot water and let it evaporate. Cook until tender. In another smaller saucepan, put the remaining 2 tablespoons of extra virgin olive oil and add the anchovies. Let the anchovies melt then add the onions. Let the onions soften with low fire but make sure they don't change color. 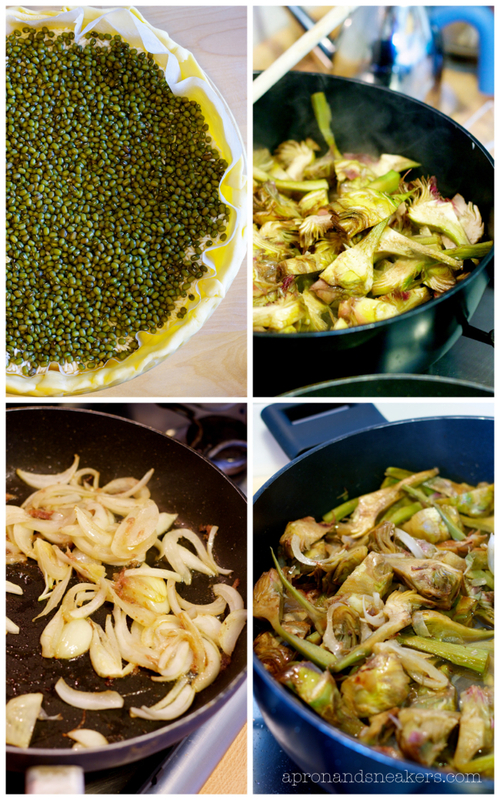 Transfer them to the saucepan with artichokes. Mix them well together then add the wine. Let it evaporate. Turn off fire. Add the chopped parsley and mix well. Roll out the shortcrust pastry and flatten with a rolling pin. Grease the baking mold with butter. Put the pastry in it. Prick the bottom part with the tines of a fork. Put a piece of parchment paper on the dough, making them higher than the sides. Cover the parchment paper with dried beans or rice (that cannot be cooked anymore after but can be used for the same purpose over and over again). These beans or rice will serve as the weight so that the pastry will maintain its shape. Bake at 190 degrees Celcius for about 15 minutes. Meanwhile, whisk the milk, eggs and grated parmigiano reggiano together. Season with salt. After 15 minutes, remove the crust from the oven. Take away the beans and the parchment paper. Put back the crust and cook for another 5 -7 minutes until the bottom part of becomes golden. Take it out from the oven again. Distribute the diced provolone on the crust. Add the cooked artichokes and spread them evenly. Pour the milk & egg mixture. 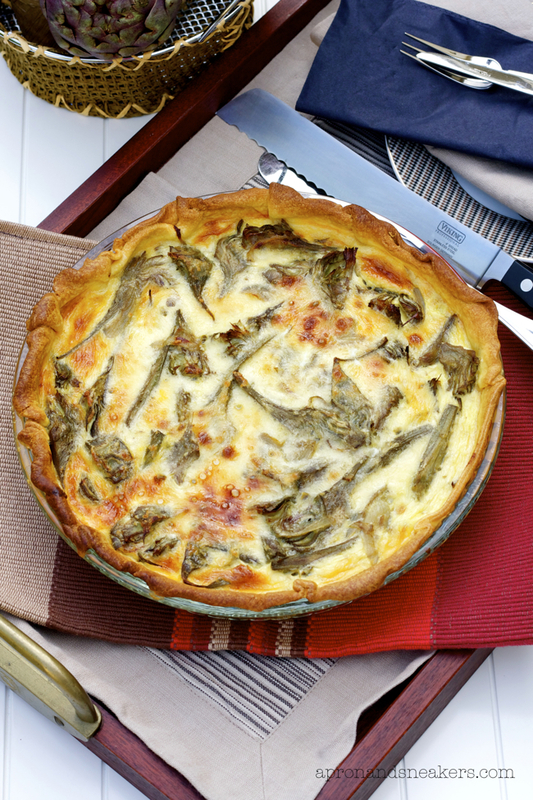 Bake for another 15 - 20 minutes at 190 degrees Celcius or until the surface of the quiche turns golden. Let it cool for about 10 minutes before serving.